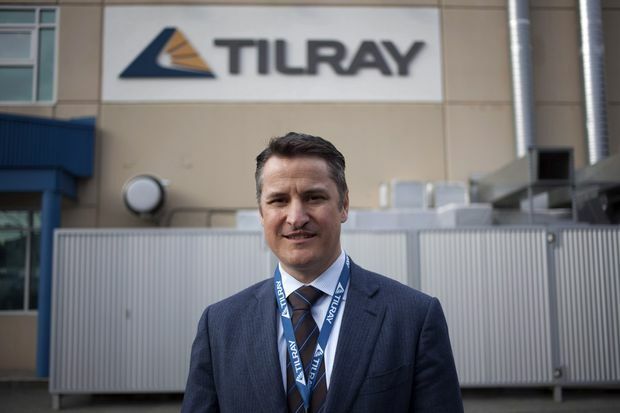 Tilray chief executive Brendan Kennedy at company's head office in Nanaimo, B.C., on Nov. 29, 2017. Tilray Inc. mistakenly predicted that the legalization of recreational cannabis in Canada would temper demand for medical marijuana, a forecast that it says has left the company short of supply and its patients scrambling to find alternatives. The cannabis company based in Nanaimo, B.C., said on Tuesday that because of inaccurate forecasts, it failed to make enough of a popular medical product. It also sold marijuana into the wholesale market to other producers and increased its exports overseas because it expected medical patients would buy recreational cannabis when it became legal on Oct. 17. Instead, demand for medical marijuana spiked, chief executive Brendan Kennedy said on a conference call on Tuesday with analysts after Tilray reported quarterly earnings. Tilray products such as capsules, oils, and dried marijuana at the company's head office in Nanaimo, B.C., on Nov. 29, 2017. Patients across the country have faced shortages since recreational marijuana was legalized and producers have struggled to meet demand. The supply shortfall has prompted complaints from patients and doctors who have raised questions about the design of Canada’s two-track system for medical and recreational marijuana, which does not require producers to give priority to medical sales. Tilray’s online medical shop is nearly sold out. The company is selling two types of cannabis oil and did not have any flower available as of Tuesday. A day earlier, it was offering a third product, its most popular oil containing a high dose of cannabidiol (CBD), which the company says is used often for inflammation. On Monday, it could have been bought only by phone – not online – and customers could have bought just two bottles each. By Tuesday, it was sold out. 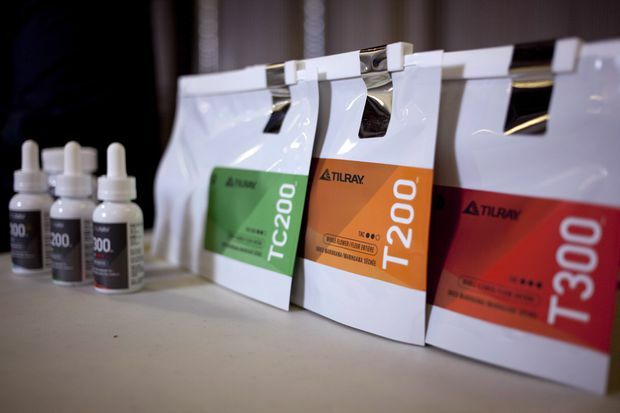 Tilray said that it expects to release a type of oil and one strain of flower in limited quantities mid-month, according to a 45-day schedule of upcoming product releases e-mailed on Sunday to patients. It expects to restock several other strains of flower in late November and throughout December. Tilray is not alone in its supply crunch. As of the end of last week, Canopy Growth Corp., Aurora Cannabis Inc., Aphria Inc. and CannTrust Holdings Inc. had more selection than Tilray, but were still sold out of some strains, oils and capsules for medical patients, according to their websites. Some producers are waiting weeks for new cannabis plants to grow or face delays getting products tested, packaged and shipped to clients. Mr. Kennedy said it is difficult to predict whether patients will stick with the medical market or go to recreational stores. Shares in Tilray, a market darling since listing in the United States in July, fell 2 per cent in after-hours trading on the NASDAQ. The company’s market value is US$10.4-billion, having it share price surging 556 per cent since its IPO. In the last three months ended Sept. 30, Tilray posted an operating loss of $26-million and revenue of $13-million. Half of its sales were from the bulk shipments to other legal producers. Prices for these sales were less than the company charges patients. It did not ship any recreational products during the period, saying several provincial distributors did not yet have the green light to receive the supplies. Mr. Kennedy said that Tilray is looking to buy products it can sell to its patients from other growers. But he said not a lot is for sale, and what is available does not meet Tilray’s quality standards. Mike Gorenstein, CEO at Cronos, in New York, on Sept. 4, 2018. Toronto-based cannabis grower Cronos Group Inc. also reported earnings on Tuesday. It generated $3.8-million in revenue in its third quarter ended Sept. 30. The company’s stock is valued at $2-billion. In contrast, on Monday, rival producer Aurora Cannabis Inc., which has a market capitalization of $8.7-billion, said it booked $30-million in revenue during the same three-month period. Those results come with a hefty price tag for Aurora, though. The Edmonton company showed a quarterly operating loss of $112-million, while Cronos recorded an operating loss of $5-million. Cannabis growers are expanding beyond Canada’s medical market to the recreational system. Analysts expect the bulk of their early recreational sales to have taken place after Sept. 30, the end of the reporting periods of both companies. Aurora, for example, booked $553,000 in sales from recreational cannabis to provincial distributors. Cronos did not disclose a figure, but its chief executive said it was “a major part” of its quarterly revenue. Mike Gorenstein, CEO at Cronos, said that the company isn’t in a hurry to buy cannabis from other producers in case quality is poor, which could thwart the company’s efforts to build a reputation with consumers. Instead, it is racing to build more growing space and researching ways to make the key ingredients of cannabis in a lab – and without the plant.